What or who is the Beast rising from the sea of humanity having seven heads and ten horns? (Rev. 13:1-5) Is it an Empire or Emperor? Its both. It is the final form of Daniel’s fourth Beast, the Roman Empire with a “Grecian leopard body” and Emperor Adonikam the 666 Beast. John saw the two phases of the end time revived Grecian Roman Babylonian Empire Beast rising from the Mediterranean sea in the final seven years preceding the return of Jesus Christ. For three and a half years its “mouth like a lion” is the false Christ Chancellor Adonikam. His peace and prosperity false gospel conquers the earth peacefully as the rider on a white horse (Rev. 6:2). Then he morphs from the “man of sin” false Christ into the “son of Destruction” seed of Satan (Gen. 3:15) and rules for 42 months speaking “great things and blasphemies” trying to change times and law of human society (Rev. 13:5. Dan. 7:25). 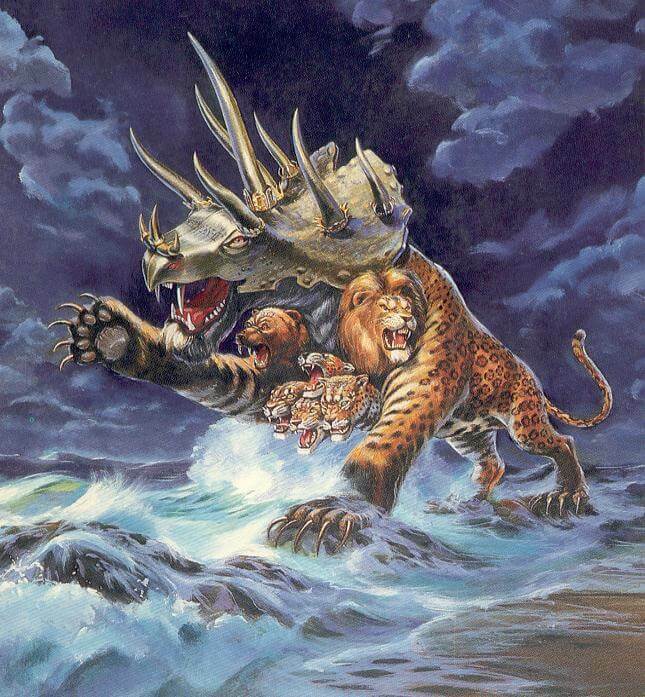 At least five reasons support interpreting John’s seven head ten-horn Beast he saw rising from “the sea” the same way God’s angel interprets the Beast (=kingdoms Dan. 7:7, 23) Daniel saw rise from the “Great Sea” (Dan. 7:2-9). 1)Commentators agree the “sea” is the Mediterranean in both. 2) Both visions have “seven heads and ten horns”. 3)Both refer to “leopard bear and lion”. 4)Both mention a mouth last. 5) In both there is a final version of the ten-horn beast-kingdom that God’s kingdom destroys. That is an overwhelming mass of irrefutable evidence the Book of Daniel provides the “interpretive key” for understanding the symbolism used in the book of Revelation. While John used the same symbolism as Daniel the actual seven kingdoms are different because John is looking from the end time into the entire span of human history whereas Daniel was looking from Babylon in his day forward. But either points to the city of Babylon being rebuilt. The seven great empires of history 1)Old Babylonian, 2)Assyrian, 3)New Babylonian, 4)Medo-Persian, 5)Grecian 6)”one is” Roman 7)British Empire. Therefore, the wounded head (old Babylon) “was and is not” (in ruins) and is healed (restored in the Roman-Babylonian Empire) and so “of the seven” but itself is an eighth king (Rev. 17:11) and goes off into destruction. The kingdoms are different in John than in the book of Daniel John is looking from the end seven year time back into human history while Daniel was looking forward from Babylon of his time. 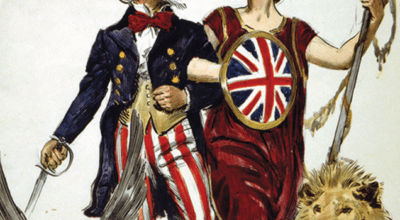 The seven great empires of history 1)Old Babylonian, 2)Assyrian, 3)New Babylonian, 4)Medo-Persian, 5)Grecian 6)”one is” Roman 7)British Empire. The beast is both Empire and the Emperor of the Revived Roman Empire. But the False Christ (Mt. 24:5) “man of sin” (2Th. 2:3-4, 8-12) rider on the white horse (Rev. 6:2) is the mouth like a lion (Rev. 13:5). Then he morphs into the “son of destruction” Antichrist (2Th. 2:4. 1 Jn. 2:18) and begins blaspheming God (Dan. 7:23. Rev. 13:5). He then receives worship (Rev. 13:8). John says the Beast’s number is the “number of a man” (Rev. 13:18). That literally is true of “Adonikam” who had 666 children and therefore the number is “of” him (Ezr. 2:13). Like before (Rev. 13:1-8) John doesn’t pause when his focus shifts from the (2342 θηρίον) beast/kingdom to the king of it, for “the remainder of this pericope (Rev. 13:11–18), it/he is referred to only by a series of eight third-person singular verbs (Rev.13:11[2x]; Rev. 13:12[2x]; Rev. 13:13[2x]; Rev. 13:14, 16) and two occurrences of the pronoun αὐτός (Rev. 13::14, 15). This figure is elsewhere referred to as the “false prophet” (Rev. 16:13; 19:20; 20:10), which clearly conveys the role the author assigns him.-Aune, D. E. (1998). Revelation 6–16 (Vol. 52B, p. 755). Dallas: Word, Incorporated. Daniel provides the interpretive keys for Revelation. In Daniel the same beast is identified both as “king” and “kingdom” (Dan. 7:17, 23). Revelation 13:1 “And I stood (estathen)” is read “He stood (estathe)” if the “n” is missing. The reading καὶ ἐστὰθη has excellent manuscript support. Since Jesus is mentioned last in v. 17, it may be best to make explicit that the subject of the verb is the dragon, and not Jesus, as is done in NIV and TEV (similarly NRSV and FC): “And the dragon stood.” The Textus Receptus, in agreement with numerous witnesses, reads Καὶ ἐστὰθην (I stood), preceded by a full stop; that is, καὶ ἐστὰθην is connected to 13:1. This variant reading appears to have arisen when copyists changed the third person verb to the first person to agree with the following first person singular verb εἶδον (I saw). NJB follows the variant reading: “And I took my stand on the seashore.”-Omanson, R. L., & Metzger, B. M. (2006). A Textual Guide to the Greek New Testament: an adaptation of Bruce M. Metzger’s Textual commentary for the needs of translators (p. 536). Stuttgart: Deutsche Bibelgesellschaft. That unsound conclusion illustrates why I always accept the Textus Receptus as the better reading. “I stood upon the sand of the sea” is a clear allusion to Daniel’s vision (Dan. 7:2-3) that is lost completely if its Satan standing like a tourist with John on the beach. Without John’s biblical allusion to the interpretive key in Daniel the symbolism in this chapter becomes incomprehensible (Dan. 7:1-28). allos (ἄλλος, 243) and heteros (ἕτερος, 2087) have a difference in meaning, which despite a tendency to be lost, is to be observed in numerous passages. Allos expresses a numerical difference and denotes “another of the same sort”; heteros expresses a qualitative difference and denotes “another of a different sort.”-Vine, W. E., Unger, M. F., & White, W., Jr. (1996). Vine’s Complete Expository Dictionary of Old and New Testament Words (Vol. 2, p. 29). Nashville, TN: T. Nelson. There is a special end time “week” that is seven years long (day = year) during which Antichrist and Christ battle. The “times of the Gentiles” separate Daniel’s contiguous Seventy weeks (Lk. 21:24. Dan. 9:24-26) from this end time week of the Antichrist (Dan. 9:27). Confirming it is seven years long, God’s two witnesses preach 3.5 years until killed by the ascending Beast (Rev. 11:7. Dan. 9:27). He rules an additional 3.5 years (Rev. 13:5). That totals seven years. Scriptural premises make this scenario likely. Only Satan or Extraterrestrial Aliens could generate the overwhelming evidence UFOs are real. Extraterrestrials Aliens don’t exist. Therefore, Satan is generating the delusion UFOs are real. Atheism preaching Extraterrestrials would be the most likely cause of a Universal Revolt against belief in God. While the definite article “the Apostasy” implies a “great revolt”, its the effect of events on “all called God or worshiped” (2Thess. 2:4) that requires this is a global revolt against theism. Scripture reveals Satan is a tactician. He has reasons for what he does. Therefore, there is a reason why he has spent so much time and energy instilling belief in UFOs, which has been the only accomplishment of the phenomena so far. It follows Satan uses that “inspired delusion” [that God “sent” by lifting His restraint on spiritism (2Thess. 2:7-12. Rev. 9:1-3; 12:12)] to convince the earth join him at Armageddon to fight God (Rev. 16:13-14). The obvious interpretation of this, the “inspired BIG LIE” false prophecy deceiving the earth is a “flying frog UFO delusion.” Therefore, the most likely cause of a sudden global rejection of Theism would be the arrival of atheist preaching Extraterrestrials. While I have not surveyed other UFO cults, I felt no need to. Satan revealed enough of his strategy to “Rael”. He redefines “Elohim” as “extraterrestrial” and overlays that upon Scripture to destroy its authority. The Satanic character of the eisegesis is evident in its following the technique Satan invented in the Garden of Eden. Cast doubt upon the meaning of God’s Word and then misdirect attention to what he is suggesting (Gen. 3:1-6. 2Th. 2:10-11). Satan is the great “ape” of God, desiring to be God. As God heralds His coming with prophets and signs, so would Satan. The appearance of the “prophet” Rael and signs of Extraterrestrial visitation conditioning mankind to reject belief in God may indicate Satan believes the End is near. Whether he is guessing right or not has yet to be determined. Satan studies scripture to know what the future brings just like the rest of us (1Peter 1:12). Therefore, after much deliberation I conclude the UFO cult of Raelism is the tool Satan uses for his coming BIG LIE. Of course “Rael” and followers were deceived as to the events that would follow their arrival. That is revealed fully in Scripture alone. Hopefully, I have discerned some of the prophecy correctly in this blog. Time will tell. Warning to Researchers in Raelism, satanic telepathic suggestion (Lk. 8:12. 2Cor. 4:3-4) and “confirmation bias” makes Satan’s eisegesis of scripture powerful persuasion, to the uncritical, disloyal and unfaithful. Only those confident Scripture is 100% correct and strong in faith should engage (2Tim. 3:16-17). Christian researchers are urged to familiarize themselves with Scott Adams theory of human perception illustrated in his book “Win Bigly: Persuasion in a world where facts don’t matter”. It illustrates how easily mass delusions form. For example, “Confirmation Bias” is the best explanation for the mass delusion evolution created life on earth. But Scott takes his theory too far suggesting no one can distinguish truth from delusion. He includes himself in that assessment. While I agree his secular world view is delusional, technological success contradicts his idea we cannot discern reality. Nothing results from manipulating delusions. Moreover, we can think critically to sound conclusions, distinguishing truth from falsehood. Contrary to Scott’s assessment, Christianity is not a delusion (John 16:13. 2Thess. 2:13-15. 1 John 2:20, 27). With that caveat, I highly recommend his book. Its an eye-opener explanation of mass delusion and the derangement we often see in society. I have selected from Raelism only what is pertinent to the coming Great Revolt. I am certain events will unfold precisely as scripture predicts, not Rael. Nothing in my blog supports or condones Raelism. Everything in my blog is consistent with belief in Sola Scriptura and the inerrancy of God’s Word. In fact, if I didn’t believe scripture is true revelation of the future, none of this would exist. Bertrand Russel’s infinite regression argument is contradicted by Scripture’s representation of God as Infinite (1 Kings 8:27). That is an incompatible property pertinent to the proposition regression to something greater always occurs. Nothing greater than infinite YHWH is possible. As for “scientific atheism”, as B. Russel insisted, regression from finite creatures to something greater must occur. Logically therefore, regression continues until the infinite is met. Therefore, the “aliens” are liars. Infinite God must begin the cycle of life.